VIOLENTOR - pre-orders for "Putrid Stench" NEW album start now ! only ! Note the CD version is available for the special price of 6.66 € during the pre-order time - after May 1st, regular price wil be 9.99 € .. PRE-ORDER NOW, SAVE MONEY and BUY MORE BEER !! 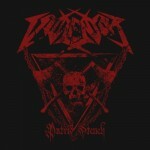 VIOLENTOR - pre-orders for "Putrid Stench" NEW album start now !